Gareth McAuley also donated one of his shirts as the players wanted to give something back after their successful summer. Michael O'Neill's side enjoyed a comfortable victory on Friday. MICHAEL O’NEILL’S NORTHERN Ireland squad have donated their match fees from last summer’s European Championships to a local cancer charity. Ahead of Tuesday’s friendly against Croatia, the players visited Daisy Lodge cancer centre in Co. Down, a facility which is also supported by Rory McIlroy’s Rory Foundation. Speaking to Sky Sports, defender Gareth McAuley revealed the players wanted to use their success at Euro 2016 in a positive way and decided to pledge their £46,000 match fees to the cancer centre. In addition, McAuley also donated his shirt he wore whilst scoring in the 2-0 victory over Ukraine in France. 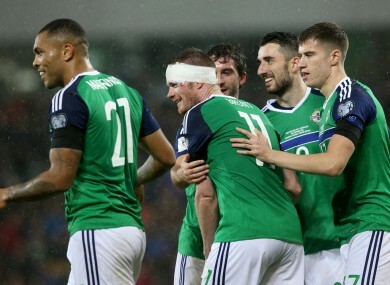 Northern Ireland continued their rich vein of form with a comfortable 4-0 win over Azerbaijan on Friday night. It leaves them in second place in Group C behind Germany. Email “Northern Ireland players donate Euro 2016 match fees to cancer charity ”. Feedback on “Northern Ireland players donate Euro 2016 match fees to cancer charity ”.